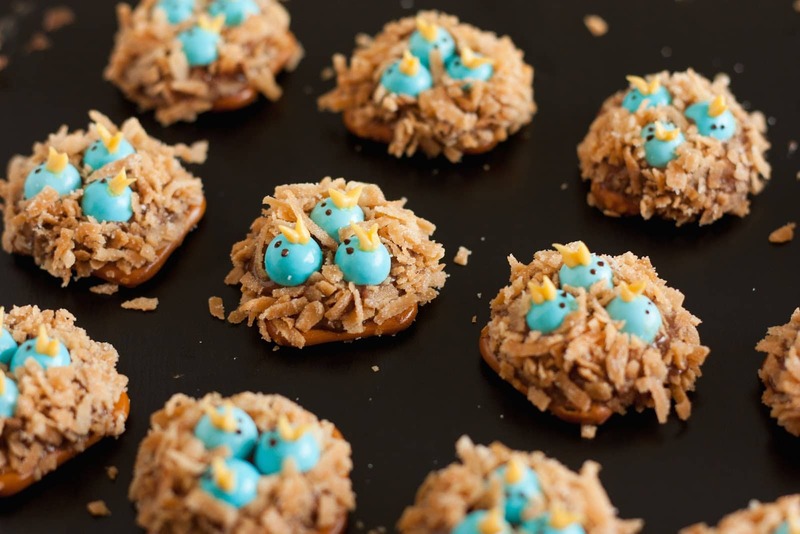 Birds Nest Pretzels – Fun and easy to make Easter treats made with pretzels, rolos, candies and candies. Aren’t treats so cute when they are in tiny form? Speaking of tiny, you should check out the tiniest doughnuts ever over at What will we do today? They are pretty much the coolest thing I’ve ever seen =). 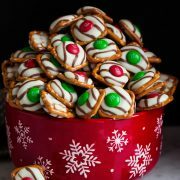 I just saw them when I was browsing Foodgawker and I instantly fell in love. As a kid they would have been one of my favorite things, like these. 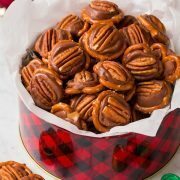 I made these based off my last post, Bird’s Nest Rolo Pretzels. They are basically the same recipe, but I made two versions because I wanted a simple version and slightly more difficult but worth it version. These actually are quite simple but just more time consuming than the other option. Take your pick between the two, either way you will have such a fun treat for Spring time or Easter. 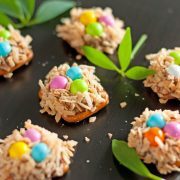 Fun and easy to make Easter treats made with pretzels, rolos, candies and candies. 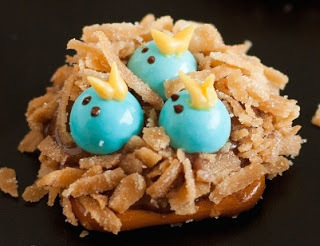 Prepare Bird's Nest Rolo Pretzels according to directions listed. In a small mixing bowl, using a fork, combine powdered sugar, butter and milk. Stir until well blended and smooth. Tint mixture with yellow and red food coloring to make an orange color (you will need more yellow than red) and stir until well blended. Scoop mixture into a small ziploc bag, and using scissors, snip a tiny tip off the end. Pipe beaks onto blue Sixlets. In a small microwave safe bowl, microwave chocolate chips on 50% in 30 second intervals, stirring after each interval until melted and smooth. Paint eyes onto Sixlets using the tip of a wooden toothpick. Store Baby Birds Nest Pretzels in a single layer in an airtight container.